Lake County has the cleanest highways in Illinois. In fact, Lake County highways are so clean you could eat right off of them. Your LakeCountyEye knows this from first-hand experience. That clean-up crew you observed policing the highway near your home was not a forced-labor chain-gang from the County lockup. 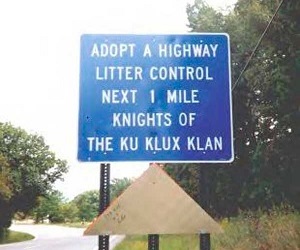 No, in all likelihood they were Adopt-A-Highway volunteers. The program was launched in early 1993 with an initial enrollment of 37 groups and has grown to 232 groups. Last year, Adopt-A-Highway volunteers saved the county $305,000 in labor costs and removed about 225,000 pounds of trash from county highways. Look for your LakeCountyEye, shovelling it.